The voice at the center of Bright Lights may be spoiled and petulant, but it also is unmistakably American: fatally romantic, distrustful of authority, and democratic to a fault, even as it sounds its barbaric yawp over the rooftop parties of the world. I would submit Jess Walter’s The Financial Lives of the Poets. It captures the suburban angst of post-Great Recession New Jersey quite nicely. I do have a bone to pick with your allegation that NJ lacks for what other states might call a city, though. Perhaps that’s true today, in the age of megalopolises that sprawl further than they should. Perhaps it’s a matter of fact that Northern NJ’s proximity to NYC and Southern NJ’s proximity to Philly makes the state’s own cities appear smaller and less distinct than they truly are. Either way, I believe Newark has more historic character–even national importance, when one looks into the race riots–than many other “cities” elsewhere in this country, especially in New York, which I’ve always felt was the most top-heavy state in the nation. Hoboken, my hometown, and its neighboring enclaves such as Bayonne and Union City (home to more Cubans than even Havana–and second in the world only to Miami) are soaked in history as well. Baseball was invented here. Football was invented here. The folks who made NYC into what it was–literally made it, as in constructed it–were from here. This is all to say nothing of course of Atlantic City down south, whose historical import to this country is pretty apparent. Point taken. Cities are not defined merely by size – “megalopolis” or “sprawl,” to use your words – but by the successful functioning of density, things like street life, a rich ethnic mix, mass transit, the proximity and variety of cultural offerings. As Philip Roth pointed out in “American Pastoral,” Newark was once such a place, thanks to its thriving glove industry. But as the novel makes so achingly clear, that city is gone now and nothing has risen to take its place. So I’ll stand by my claim that New Jersey is not home to a single true city TODAY. I didn’t know that baseball and football were invented in New Jersey, but I was aware that many Jerseyites share your home-state pride. In that Times article I quoted, New Jersey native Mark Leyner notes that his vast store of state trivia includes the achievements of William Carlos Williams, the duel between Alexander Hamilton and Aaron Burr, and the names of all the New York Yankees who used to live in Teaneck. I think most Americans share this bizarre strain of hometown pride. My fellow Detroiters still get misty about the Model T, Ty Cobb and Stroh’s beer – three things that have, mercifully, faded from the scene. Unfortunately, that timeless Motor City delicacy, the Coney Island hot dog, endures. Mr. Morris, you don’t know much about New Jersey. I took Prof. Rockland’s class at Rutgers, by the way. Maybe he’ll let you audit the next time it’s offered. Yep, I’ll certainly take that, Bill. I agree with Gates that the state today has “a kind of vagueness about it.” Probably it’s to do with the fact that its best history is behind it, and that the North is different from the South of the state anyway–it’s a “novel-in-stories” of a state in that its got pockets of varying history all over the place, little sketched vignettes more than a cohesive narrative, or even one that’s recognizable today. We’re a hodgepodge like that. Much of my estimation of the state, I’ll admit, has been passed down from my family members who’ve lived here for decades, who remember things (or know where to find things) that don’t exist here anymore unless you really, really look for them. In Hoboken, for example, there’s a block of luxury condominiums where a few of the NY Giants live; it’s called The Maxwell. Fifty years ago, The Maxwell was a real Maxwell House Coffee Plant, and the entire city of Hoboken smelled like roasted java beans each morning. You’d be hard pressed to find a resident today who even knows about that; the gentrification of the city tossed those folks to Weehawken and West New York long ago. But then again, that’s probably true in a lot of places in this country, and always will be. If American Pastoral had not been on this list, I would have deleted my bookmark for The Millions and been on my way. It is the great American novel of the second half of the 20th century. Second place is a greater debate, but I’d go with The Sportswriter. Tom Perotta’s book of linked stories, “Bad Haircut”, also set in New Jersey, definitely needs to be mentioned. I was born and raised in New Jersey, and the place this article describes–to be frank–sounds nothing like the New Jersey I know. If you were to abstract the state, sure, there are drones in office parks, ratty teenagers and prissy ladies in the malls, and a burning strip of sunbathers along the shore. But I don’t see how that translates into vagueness or a lack of community, history, or “center.” If you have a bit of imagination (and you actually go there), you’ll see that New Jersey is a vivid, diverse place, rife with dreamers and eccentrics, not just an expanse of manicured lawns, toxic dumps, and extramarital affairs curling at the edges. This strikes me as a singularly male (oh, sorry, one female writer, thanks) and outsider perspective on the state. Man, this is such a New Yorker’s version of New Jersey. If Cory Booker sees the post he’s going to tweet the hell out of you, dude. Not to mention the good people of Haledon — that’s a real town where people live, you know. But seriously — New Jersey is no more or less an authentic place that anywhere else. In broad outline, it’s basically the same as Connecticut — a bunch of decayed, not-yet-gentrified satellite cities surrounded by lush suburbs and exurbs, a lot of rich people (N.J. has three or four of the ten wealthiest counties in the country, and trades places with Connecticut as the two states with the highest per-capita incomes), criscrossed by commuter rail lines to Manhattan, and one Ivy League university. To me, the one discernible advantage Nutmeggers have over Jerseyans is that they get to enter New York through Grand Central instead of the catacombs of Penn. Ultimately, though, I don’t think this sort of regionalism really serves any of us. (I’m a proud New Jerseyan, but I find things like the New Jersey Hall of Fame patheticly provincial and embarrassing.) Who’s keeping score, anyway? Ugh — I wish I could edit those typos. Some great novels here. Though a vagueness? maybe if you come here from New York, and hide in a commuter suburb. Like its many terrains, Jersey has many different cultural regions. If you think Jersey is generic, you haven’t traveled much. If there ‘s no novel that describes the state as a microcosm of the country’s class and race issues, I’ll have to write it. Tsk, tsk, tsk… where is Sam Lipsyte??? HOME LAND! Venus Drive. New Jersey is complex. It has a population larger than Iceland with as many ethnicities and nationalities as the EU packed within a tiny space. There are farms, orchards, gritty urban areas, seashore reminiscent of NC’s Hilton Head, and an entire southern stretch of cranberry bogs. It is not simply surburbia. There is also a mentality that few outside of New Jersey understand. I think that’s where the comment about “a New Yorker’s version of New Jersey” may be apropos. To give a literary perspective to New Jersey is difficult. We’re the red-headed step-cousin of New York. We don’t have a wide supply of novelists yearning to mark its uniqueness. It is why a friend and I edited an anthology of short fiction, poetry, and essays from New Jersey writers about NJ. I edited it but I mention the anthology because it is not just me but voices( including Micheal Rockland) from North, South and Central Jersey, from exit 3 to exit 9 to exit 15 of the turnpike. It is called “What’s Your Exit”. It’s like what if no one ever wrote a New York novel that took place below 14th Street? You’re a tough man to please! You contend that “it’s the fault of all writers that for some reason literary history has completely ignored half of the state of New Jersey.” I don’t believe literary history sets out to ignore places, nor do I believe it’s anybody’s “fault” that so many terrific novels happen to be set in northern New Jersey, including “American Pastoral,” “Jernigan” and “The Brief Wondrous Life of Oscar Wao,” to a name a few. Help us out here. Tell us about the great SOUTH Jersey novel. I don’t think anyone has. There’s like a complete media blackout about the place. Yet there it is, this vast chunk of the state where “What exit are you from?” doesn’t even mean anything because there is no Turnpike, the greenest part of the Garden State, filled with cranberry bogs, fishing towns where fresh muskrat is served at diners, the most dangerous city in the country (Camden), the final resting place of Walt Whitman (Camden), the weirdest beach town in America (Wildwood), the prettiest beach town in America (Cape May)…I could go on, as could anyone from SJ, but they don’t, because there just aren’t any books about it, and frankly I’m not sure why. If no one had ever written a novel about Downtown Manhattan we’d have to blame someone for ignoring it, right? So I’m blaming everyone. Erik, you might be interested in the poetry of Stephen Dunn, especially his book “Local Visitations.” And — again, not a novel, but just as rewarding — The Pine Barrens if you haven’t read it already. I wouldn’t feel too badly about it — after all, no one’s written The Great Delaware Novel yet, either. 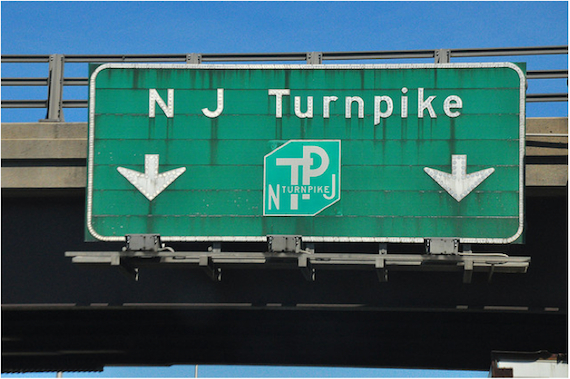 However — there is too a Turnpike in South Jersey! Half of it is below Trenton and runs right through the Philadelphia suburbs! And “what exit?”, tiresome as it is, really applies more to the Parkway — many, many more exits — which as we all know, Exit 1 is Cape May, etc. This introduction, along with Mr. Gates’ and Prof. Rockland’s comments, evokes the bedroom communities which dominate Northeastern New Jersey. New Yorkers and the daily bridge & tunnel crowd will read these narratives with some interest, obviously, but the texture of life in New Jersey changes dramatically as you focus on other communities. To name just one example, Roth’s Old Rimrock is only “implausibly pretty” if you’ve never been to the lush places near Morristown he drew on for that representation (probably Mendham). Reading the other comments, I’m not the only one who’s realized this. Thus, I’d like to submit a counterproposal to Prof. Rockland’s “New Jersey novel”: the Suburban novel, which mines New Jersey for the office parks, malls, and exhausted commuters and nothing else. Culturally brain-drained suburbs exist everywhere next to major cities, after all, and I don’t see any evidence that northeast New Jersey started this trend. This gives credit where its due to authors such as Roth or Diaz who have found such rich material in my home state, and without hiding in the shadow of Manhattan. the angst of growing up in the sunburbs. Indian imigrant who works in a gas station. As a native South Jerseyan, I can’t help but disagree with this sentiment. What about the Pine Barrens of Southern NJ? Certainly a very distinct region, with a very distinct cultural feeling about it. Certainly, not a lot has been written that underscores NJ’s “cultural peculiarities”–but this doesn’t mean they aren’t there. And, you know – on second thought, I would actually say that a lot already has been written on these “regional peculiarities” – proving that they do in fact exist. John McPhee’s “The Pine Barrens”, though not a novel, is a classic. More books are also now emerging that reflect the South Jersey experience, including Lisa Borders’ “The Fifty-First State”, and my own book, “The Truth and the Life”. There is much more to New Jersey–and to its literary potential–than the greater NYC area. I hadn’t dreamed that the writing itself wasn’t worth saving; losing it all might have made me consider what parts of it were worth remembering.